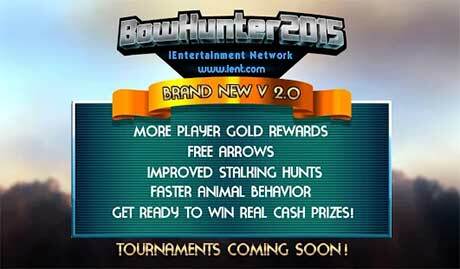 New Improved Bow Hunter 2015 Version 2.0, released with more GOLD REWARDS, FREE ARROWS, IMPROVED STALKING HUNTS, FASTER ANIMAL BEHAVIOR, and MORE! 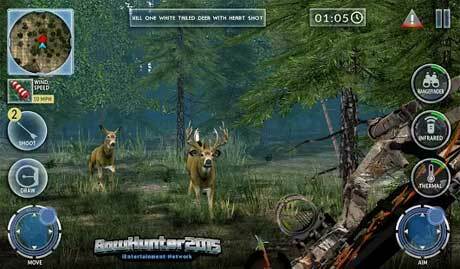 Archery, Hunting, and Deer Hunting in detailed three dimensional terrains combine in the Bow Hunter 2015 V 2.0 simulation of outdoor game action. 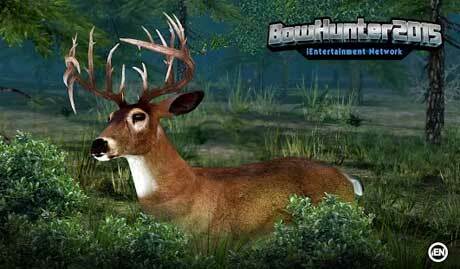 White Tail deer, Mule deer, and Black Tail deer are all sought as hunting trophies in the Bow Hunter 2015 simulation. Players can stalk or hunt from tree stands in detailed 3D terrains using all the techniques of real bow hunting including powerful bows, special arrows, optics, and camouflage of the player’s choice. The deer in the simulation are easily spooked and will run quickly from the hunter if the hunter does not use the proper bow hunting techniques. The simulation contains over 200 hunts, with increasing difficulty, requiring better and better equipment, techniques, and hunting expertise. Bow Hunter 2015 does take a powerful device to play – you need 1 Gig of RAM and a dedicated GPU, (graphics processor unit) to play the BH 2015 sim. Please check your device specifications here to determine if you can play BH 2015. http://www.gsmarena.com/. Please don’t give us a bad review if you cannot play. Send email to custsvc@ient.com and let us know your device and we will check it out!